Last year I started making these adorable little flower squares. My intention was to make two cushion covers out of them for my living room as the current ones were looking a bit shabby. At some point during the process I got bored of making them though and changed my mind. 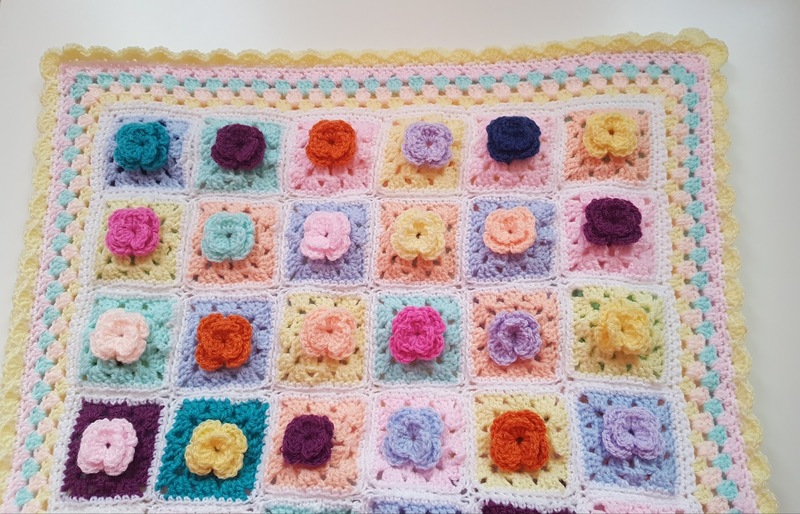 I then decided to revert back to the original baby blanket pattern which the squares came from but got a bit sidetracked and the whole thing just ended up being plonked in the drawer with all my other UFO’s. 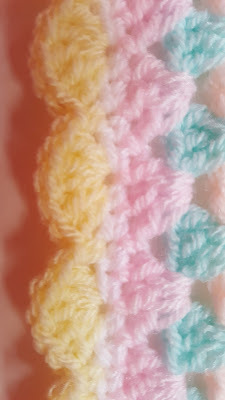 Making the baby hats a couple of weeks ago reminded me that this project was still sitting there, unfinished and unloved. So it then became a bit of a mission to finish it. In the original pattern, the blanket is made from 221 squares which are joined to form a rectangle. It is then edged with a DC/picot border. 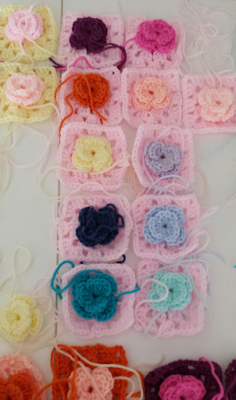 As it is made from 4 ply yarn and a 2.5 mm hook each square is only a dainty 5 cm (2"). Really cute, but I wanted to use up some of my stash for this so I simply replaced the yarn with DK and the hook size to 4 mm. 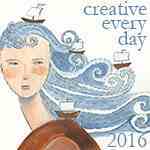 which gave a slightly less delicate square measuring 3". When I went back to the project, I realised that I had made a massive 61 squares! 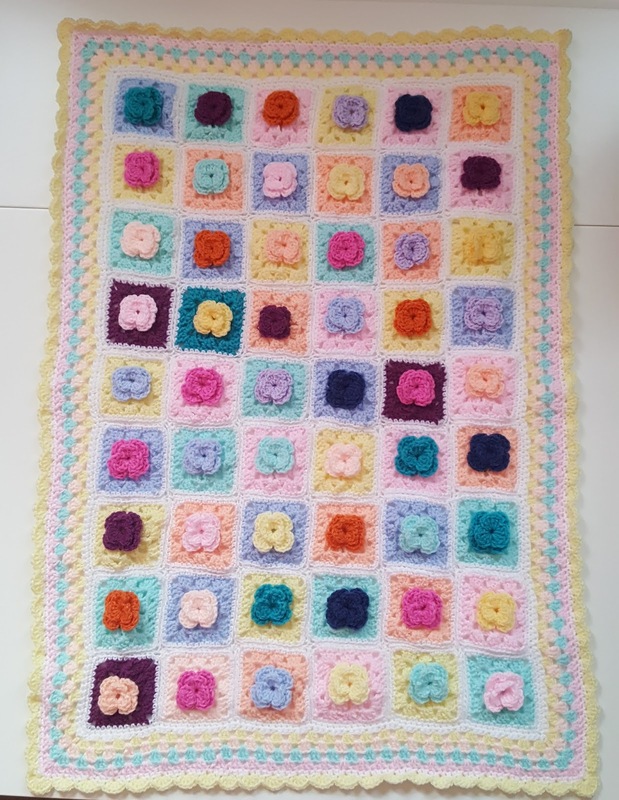 I wanted my baby blanket to be roughly the same size as in the pattern but I didn’t want to make any more squares. In the end, I worked out that a width of 6 squares and a length of 9 squares would give me a similar sized blanket.This would also use 53 of the squares. I had already joined some of them so it wasn’t too much work to get to a reasonable sized rectangle. I felt like my blanket was really floppy at this point and was a bit worried that it wouldn't drape or even fold very well. I considered adding a very deep border to it to give it some stability but after adding three rows of DC in white around the edge it seemed a lot better. 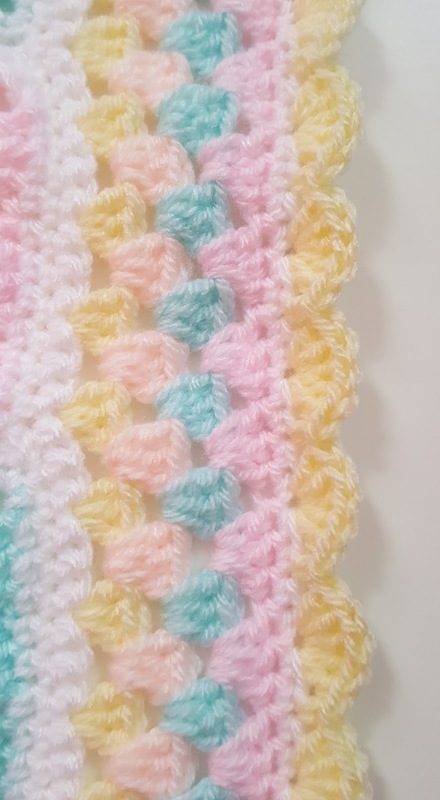 I didn't want to complete the blanket with a picot edging like in the pattern because I felt like it was a bit too delicate for the yarn I had used so I crocheted 4 rows of granny stripe in contrasting colours, followed by a row of DC. I then added a small shell edging. 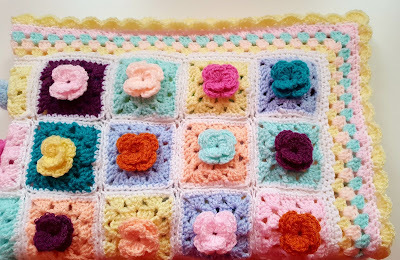 I think that it is very pretty and it has the advantage of making the blanket slightly larger as well. I'm particularly proud of my corners! They turned out to be very neat and the shell goes around the corner in the same way in all four. Go me! The finished blanket measures approximately 59 x 84 cm (23 x 33"). 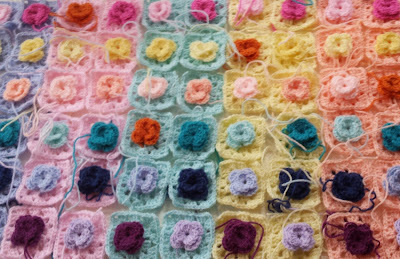 It looks a bit wonky and I'm not sure that I did the best job of joining the squares but it's colourful and fun. 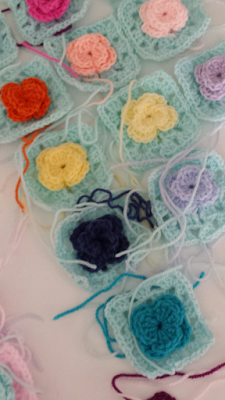 It's a really lovely pattern and the squares are surprisingly easy to make, if a little fiddly. They also become a bit tedious to make after a while and I can't imagine ever having the patience to make 221 of them! But I do think the results are really lovely. 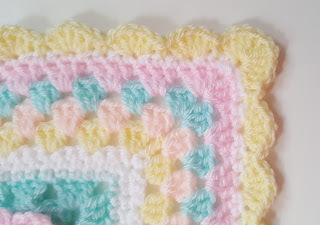 I also think it's an easy pattern to adapt if you don't want to make quite so many squares and you can really personalise it with your own edging. I bet it would work up really quickly and be unbelievably snugly in a chunky yarn too.